A clean restaurant ensures sanitary conditions for the wellness of your patrons. It also guarantees you as the owner are keeping up with health codes to keep your doors open. From restaurant grease cleaning to organizing your storage, below are the top five tips for a clean eatery. 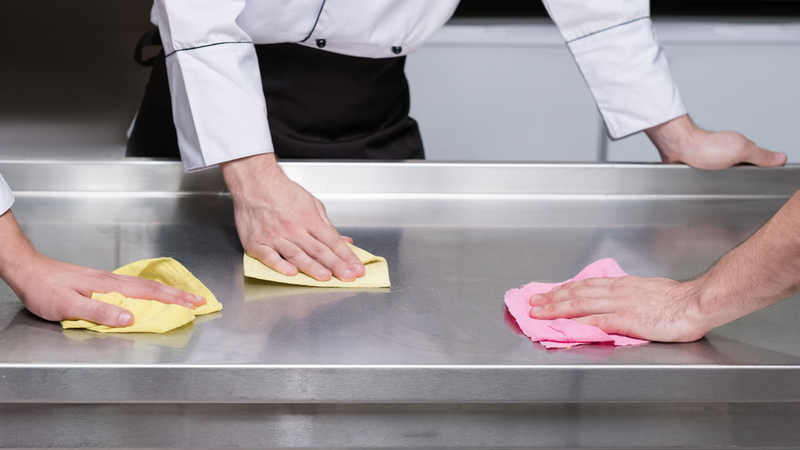 A clean kitchen is critical for a restaurant. Grime and bacteria build up quickly in a busy food prep area. Keep all surfaces sanitized and clean up spills quickly. Make sure oven hoods are wiped down, and clean fridges and freezers regularly to remove expired food. Make sure small appliances, tools, and utensils are cleansed after each use and, if possible, run components in a dishwasher so high heat can kill germs. Dried goods and small kitchen tools should be neatly organized in storage closets so your staff has easy access to them during a busy service. Regularly inspect for expired items, broken components, or worn out storage containers. Replace what is needed to keep everything fresh and clean. Restaurant grease cleaning is important for a long list of reasons. Cooking grease not only harbors bacteria, but it is also a fire hazard when left to collect. In addition, it will clog your drains and may even pose a slip risk for employees if there are spills on the floor. Always dispose of grease properly and make sure regular restaurant grease cleaning is scheduled to clear out traps before they enter your sewer or septic tank. Keep the front of the house tidy for patrons. Vacuum regularly and make sure linens aren’t stained or frayed from wear and tear. Dust windows and ledges, and clean any drapes and blinds every few days to remove dirt and food particles. Attract more customers with a pretty exterior. Powerwash the building every few months and inspect that awnings and signs are clean and working. Add a little charm with flowers or plants, and if you have outdoor seating, ensure furniture is clean and free from rust and debris. Located in Anchorage and serving the Kenai Peninsula and Mat-Su Boroughs, Around the Clock Pumping offers 24-hour septic system and drain cleaning services to ensure your property is clean and operating well. For more than 17 years their licensed team has provided everything from restaurant grease cleaning to line jetting for commercial and residential locations. To learn more about their pumping service, call (907) 345-9126 today or visit them online for their contact form. Other Announcements, Events and Deals from Around The Clock Pumping LLC. A. Around The Clock Pumping LLC.